Substitute Lloyd Dyer scored with eight minutes remaining to earn the win that moves Birmingham level on points in the Championship with opponents Charlton. The winger lashed a 20-yard shot past Stephen Henderson to inflict Charlton's second away defeat in six. Charlton stay 10th on goal difference, though, with Birmingham a place lower. Blues had the better chances with David Cotterill hitting an upright and Henderson superbly saving Jonathan Grounds' header late on. Robert Tesche, twice, and Diego Fabbrini also spurned openings before Teshe released Dyer to score with a raking, low drive. Charlton's best work in the game involved Tony Watt. The Scot was twice denied by Darren Randolph and also set up Igor Vetokele for a shooting chance, only for the goalkeeper to intervene again. "It was very important to come out in the last home game and put in a performance befitting the progress we have made. "Some of our attacking play was very good and in the end it was fitting that Lloyd Dyer scored the only goal with a great finish. It shows what a fantastic player he is and the fine career he has had." "It was really a poor performance. The way we played was not very good. We played without patience and over 90 minutes we deserved to lose. "I think it was our worst performance since I joined the club. The object was to play positively and I didn't like this kind of performance." Match ends, Birmingham City 1, Charlton Athletic 0. Second Half ends, Birmingham City 1, Charlton Athletic 0. Wes Thomas (Birmingham City) wins a free kick in the attacking half. Substitution, Charlton Athletic. Alou Diarra replaces Jordan Cousins because of an injury. Attempt saved. Paul Caddis (Birmingham City) right footed shot from the right side of the box is saved in the top right corner. Assisted by Demarai Gray. Attempt blocked. Lloyd Dyer (Birmingham City) left footed shot from the centre of the box is blocked. Assisted by Robert Tesche. Attempt missed. Tony Watt (Charlton Athletic) right footed shot from the left side of the box misses to the left following a corner. Corner, Charlton Athletic. Conceded by Robert Tesche. Goal! 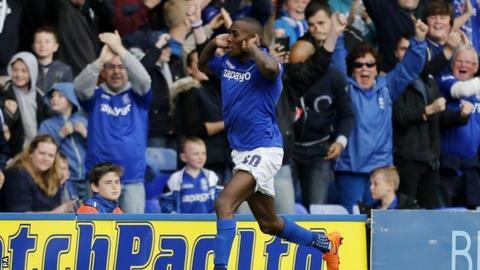 Birmingham City 1, Charlton Athletic 0. Lloyd Dyer (Birmingham City) left footed shot from the left side of the box to the bottom right corner. Assisted by Robert Tesche. Corner, Charlton Athletic. Conceded by David Davis. Substitution, Birmingham City. Wes Thomas replaces Diego Fabbrini. Simon Church (Charlton Athletic) wins a free kick on the right wing. Substitution, Charlton Athletic. Simon Church replaces Igor Vetokele. Jordan Cousins (Charlton Athletic) is shown the yellow card for a bad foul. Attempt missed. Lloyd Dyer (Birmingham City) left footed shot from the centre of the box is high and wide to the left. Assisted by Robert Tesche. Attempt blocked. Demarai Gray (Birmingham City) right footed shot from the centre of the box is blocked. Attempt blocked. Demarai Gray (Birmingham City) right footed shot from the centre of the box is blocked. Assisted by Robert Tesche. Substitution, Birmingham City. Lloyd Dyer replaces David Cotterill. Attempt blocked. Demarai Gray (Birmingham City) right footed shot from the left side of the box is blocked. Assisted by Michael Morrison. Attempt missed. David Cotterill (Birmingham City) header from the centre of the box misses to the left. Assisted by Clayton Donaldson following a corner. Corner, Birmingham City. Conceded by Roger Johnson. Attempt saved. Tony Watt (Charlton Athletic) left footed shot from the left side of the box is saved in the centre of the goal. Assisted by Chris Eagles. Substitution, Charlton Athletic. Chris Eagles replaces Frédéric Bulot.